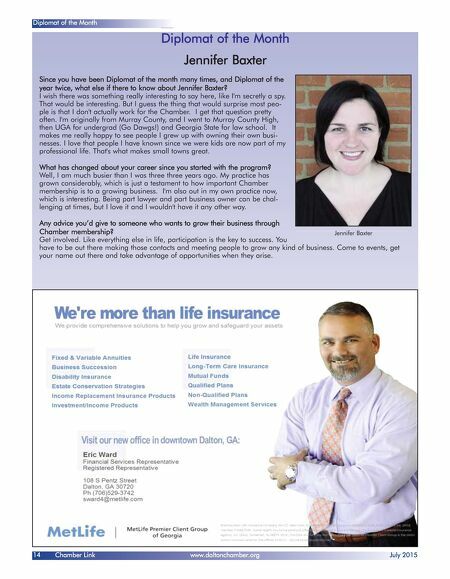 July 2015 www.daltonchamber.org Chamber Link 15 Chamber Connections Chamber Connections at !"#$%&#'()*+ ! "#$%!&$'#"" ##%# '*%#%$%(*'"+%)#)*%#+%'%)"*+*% %'! ""!% P r i n t i n g R e i m a g i n e d Design and print real parts on demand right from your desktop. Design and print real parts on demand right from your desktop. 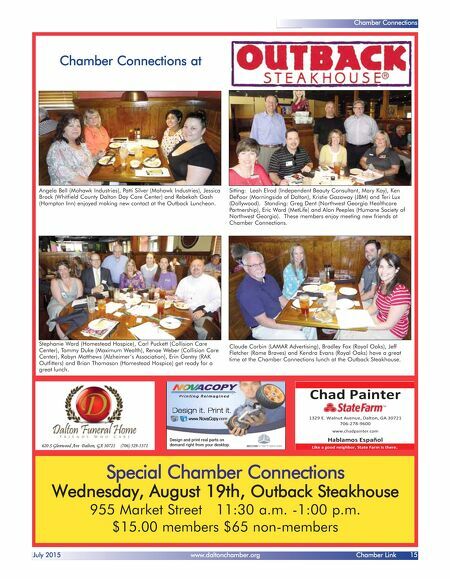 Special Chamber Connections Wednesday, August 19th, Outback Steakhouse 955 Market Street 11:30 a.m. -1:00 p.m. $15.00 members $65 non-members 620 S Glenwood Ave DDalton, GA 30721 (706) 529-5371 Claude Corbin (LAMAR Advertising), Bradley Fox (Royal Oaks), Jeff Fletcher (Rome Braves) and Kendra Evans (Royal Oaks) have a great time at the Chamber Connections lunch at the Outback Steakhouse. Stephanie Ward (Homestead Hospice), Carl Puckett (Collision Care Center), Tommy Duke (Maximum Wealth), Renae Weber (Collision Care Center), Robyn Matthews (Alzheimer's Association), Erin Gentry (RAK Outfitters) and Brian Thomason (Homestead Hospice) get ready for a great lunch. Sitting: Leah Elrod (Independent Beauty Consultant, Mary Kay), Ken DeFoor (Morningside of Dalton), Kristie Gazaway (JBM) and Teri Lux (Dollywood). Standing: Greg Dent (Northwest Georgia Healthcare Partnership), Eric Ward (MetLife) and Alan Peeples (Humane Society of Northwest Georgia). These members enjoy meeting new friends at Chamber Connections. Angela Bell (Mohawk Industries), Patti Silver (Mohawk Industries), Jessica Brock (Whitfield County Dalton Day Care Center) and Rebekah Gash (Hampton Inn) enjoyed making new contact at the Outback Luncheon.